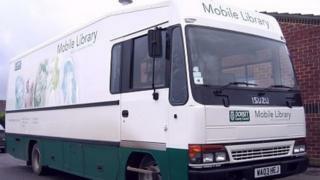 Proposals to scrap all but one of Dorset's mobile libraries have been backed by a council committee. It recommended senior county councillors agree to remove three of four mobile library vans from service. As reported in the Dorset Echo, people living near county boundaries would be allowed to access libraries over the border under the plans. Concerns cuts would lead to social isolation would be addressed separately, the committee said. Dorset County Council said its Partnership for Older People Programme was working to tackle social isolation in areas where the service was being cut. In May, the authority confirmed more than 70 out of 250 library van stops would be withdrawn, partly due to a decline in the number of users. The authority said it was working with the Good Neighbour Scheme and Home Library service to find alternative ways to provide access to library services. Learning and skills councillor Deborah Croney said: "These changes will help us focus provision of the mobile library service on people of all ages who cannot get to a library building." The final decision will be made when the cabinet meets on 29 June.